After graduating with honors from Wesleyan University in Middletown, Connecticut, Louis Ciccarello received his law degree from Stanford University. He has worked continuously for Lovejoy And Rimer, P.C., and its predecessors for more than 50 years. Mr. Ciccarello’s areas of practice include personal injury, worker’s compensation, municipal law and general litigation. 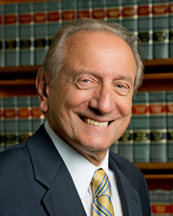 He served as chairman of the Norwalk Board of Estimate and Taxation, vice chairman of the Norwalk Board of Education, and as Connecticut State Senator from 1975-77. He has also served as assistant counsel to the towns of Wilton, Weston, and New Canaan. He was corporation counsel for the city of Norwalk from 2001-2005. He was an instructor in Litigation and Business Law at Norwalk Community College from 1984-1999. Mr. Ciccarello lives in Norwalk, where his three children were born.